What practical arrangements can be made in anticipation of diminishing oil availability? My esteemed colleague Gib at the Truthalyzer blog recommended that I include a practical guide to action in the next edition of Survival+. I have been mulling how to do this without making an already gargantuan text of 140,000 words into one of unreadable length. My intent in Survival+ was to offer up the principles of practical action rather than add another checklist to the many good lists already out there. Nonetheless, I understand the value of filling the gap between principles and practicalities, and so I'm assembling various ways to do so in a few thousand words. Readers of this blog will get all the practicalities as I work them out. Practical solutions flow from an integrated understanding. That is one of the principles of the Survival+ critique. If we haven't thought through the context of the problem(s), then our "solution" will not be very practical, even it may appear so at first blush. So let's start with the "big context" of energy. 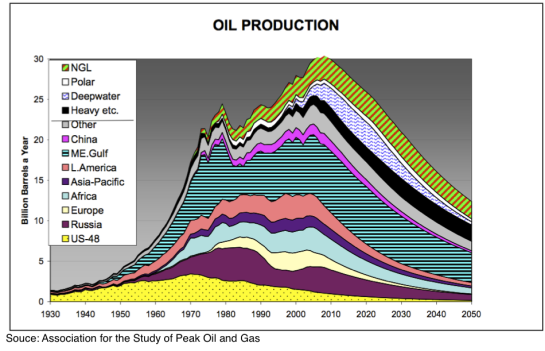 Here is a chart depicting Peak Oil. Note that fossil fuels don't just suddenly drop to zero; they remain available but in ever-diminishing quantities. Thus we can expect not a suddenly fossil-fuel-less context but one in which the oil available to be consumed in the U.S. daily drops from the current level of 19 million barrels a day to say, 9 million barrels a day (MBD). 2. rationing, as high prices eliminate many citizenry from the potential pool of buyers. Many people have quasi-religious views on "market prices" and rationing, and I find these aren't very helpful or practical. The market will respond to shortages by pushing prices beyond the comfort zone of most consumers--that is the only way to restrict consumption to available supply. Politically, $10/gallon gasoline will create a "problem" for politicos currently in power, and thus we can safely predict that the Federal government will institute some sort of rationing system. As noted above, many people have quasi-religious views on rationing, e.g. "it never works." As a counter-example, we should look at the massive rationing which operated at every level of the U.S. economy in the four years of World War Two. Despite the usual petty profiteering, hoarding, etc. which is to be expected in any rationing scheme, by and large the rationing system "worked" in the sense of distributing essentials in a somewhat equitable fashion. If we can anticipate both high prices (because we will still live in a quasi-market economy) and rationing (because the high cost/limited availability of gasoline will be politically inconvenient), then we can see the outlines of some practical solutions. We can anticipate that the Central Government will institute control of the nation's energy production and imports, with an eye on fueling the U.S. Armed Forces, maintaining civil order and maintaining the agricultural productivity of the nation. As incompetent, corrupt and venal as our "leaders" of both parties are, the weight of reality will eventually overcome even crass stupidity and bribes and some sort of basic energy triage will be put in place just to ensure people are fed and civil order is maintained. Thus we can anticipate that the civilian populace will bear the brunt of fuel shortages and/or rationing. So it makes sense to arrange one's living conditions to prepare for a future in which energy is both limited and costly. 1. Live as close to work as possible. This would seem a simple step, but in a dynamic labor market beset by high structural unemployment, it may not always be possible. Nonetheless it should be on every "checklist" as a practical response to the coming shortages of transportation fuels. One way to save on fuel required to commute is to get rid of the commute entirely. My grandparents lived above their paint manufacturing business for years. They "commuted" to work by walking down a flight of stairs. This was once a common way of living. Hundreds of thousands of Americans are choosing to start land-based businesses (called small farms) which also cut commutes to zero: The latest five-year farm census in 2007 showed nearly 300,000 new farms started since 2002, most of them small. If one can't move close to a job, then being self-employed removes the distant job from the equation--presuming one lives in an area where there is a concentration of potential customers, or one works mostly online so the physical locale of the web connection doesn't matter. If one can't be close to work, then perhaps proximity to a job market (i.e. a city or town) is a close second-best choice. 2. Own and use low-energy transportation: bicycles, cross-country skiis, electric bikes, low-horsepower motorcycles, boats and snowmobiles, etc. One of my projects this summer is to rehab the household's numerous bikes which have been given to us or we've found abandoned: a small-frame Gary Fisher, a 30-year road bicycle, an old Schwinn, etc. At last count there are seven bicycles around. We usually use only two, but the others will be handy to loan to transportless friends/neighbors. Bicycles are without doubt the most energy-efficient, amazing machines on the planet. They last almost forever with modest care and can also haul quite a bit of commerce. Did I mention we ride bikes a lot? As a good rule of thumb, let's assume that there will only be gasoline (at any price) for one trip a week into town for shopping/errands, etc. with the outside possibility that it will be more like once a month. That suggests living some place within easy bicycle/cross-country skiing range of markets/social-capital centers (churches, town hall, neighborhood shopping district, etc.). Five miles each way on a bike is a relatively easy ride, once you work up to a reasonable level of fitness. Your own calculations of optimal distance from customers/ markets/ social-capital centers will depend on the contexts of weather, age, disabilities, etc. A six mile/10 kilometer radius is a good starting point for a discussion of low-energy transport. Just as an aside, snowmobiles and mountain bikes work well on poorly maintained roads. On a bike, you can weave around giant potholes. A mountain bike works well on gravel roads or worse (just watch the turns going downhill on gravel roads). As Jim Kunstler noted in a talk he gave awhile back, we can also anticipate a decline in well-maintained roads. So it makes sense to optimize our location/work and transport for this reality. I recently carried the bumper of a 1998 Honda Civic across town on my bike. I imagine this caused some astonishment or curiosity in passersby, but in Third World countries then this would have been entirely normal. Bike transport makes sense when petrol is unavailable or extremely costly. Some sort of towed cart enables large loads to be transported great distances via bicycle. 3. Fitness and some maintenance skills will come in handy. I am 56 years old, and often ride 10 miles on a bicycle just to clear my head. I am not a marathon athlete or super-duper fitness nut. Yes, it does take some modest effort (see yesterday's entry Effort Shock, Future Shock and the Promise of Transformation). Alternatively, one could start acquiring some working knowledge of small motorcycle, outboard and snowmobile engines and various aspects to their maintenance and repair. Learning how to make small engines 'flex-fuel' so they run on ethanol/petrol mixes might be a good idea, too (usually just swapping out the plastic fuel line with a stainless steel one). 4. Consider producing some of your own energy and adapting your transport to run on that energy. I am always surprised to get "hate mail" when I promote the idea of owning your own solar array, be it photovoltaic, solar water heating or concentrated-heat systems which focus the sun's rays into generating steam. Recently, a correspondent said I'd been reading too much science fiction, as panels are costly, require cleaning, etc. True enough. But when oil consumption is cut in half, all sorts of hairbrained schemes to gasify coal, etc. will be promoted, and they will all turn out to be very costly and limited in their scalability (i.e. tearing up half of Montana will yield one million barrels a day, max, replacing a mere 10% of what has been lost to global decline of production). You can of course trust Big Oil and Big Government to "solve" the "energy crisis," or you can think about reducing your own consumption by half and perhaps investing in your own energy production. A couple of solar panels is enough to charge an electric bike, and when the liquid-fuel vehicles are all sitting around empty because the ration has already been consumed or the gas stations are dry, then an electric bike will be very welcome indeed. Some commentators believe we can switch to natural gas, which is still relatively abundant in North America. While switching buses and other essential transport to natural gas may be feasible, I see no evidence that we as a nation can swap out 10 million barrels a day of oil consumption with natural gas. Yes, switching might add a million barrels a day, or some other similar number, and that will be welcome. But the bottom line is there is no way to replace 10 million barrels a day with natural gas, nuclear power (where does all that waste get recycled? We're still waiting for "solutions" which are scientifically and politically feasible), shale oil, etc. The fantasy that we can maintain our current levels of energy consumption via the magic of technology is bound to denial like hydrogen is to oxygen in the water molecule. It takes more energy to break that bond than there is in the released hydrogen. So those bound up in denial and fantasy will be unprepared. That too is "obvious." Alternatively, we can choose not to indulge in fantasy and denial. Thank you, Lee V.D.B. ($10), for your third most excellently generous donation to the site-- I am greatly honored by your support and readership. Thank you, Russell W. ($25), for your superbly generous contribution to the site -- I am greatly honored by your support and readership.